With our country in the midst of a severe economic depression, it is quite amazing that a car this stunningly beautiful should emerge. Car styling was just then coming into vogue; and without a doubt, the Chrysler CD Eight was a style leader of that era. Patterned after the renowned L-29 Cord, Chrysler used a heavy chromed, pointed, V-type radiator shell, an extremely long hood, broadly sweeping fenders and a low slanted windshield. The combination of these design features resulted in what was then described as the most beautiful Chrysler ever built. In production for just six months, (only 511 were ever built), this was a limited production car. 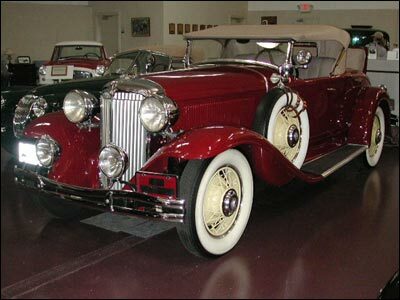 Today, the Chrysler CD 8 Roadster is extremely rare and considered by many to be an object of art. This elegant 1931 Chrysler Roadster took a first place award in its class at the Walter P. Chrysler photo meet in 2000. Restored by Jack Edmiston, it is on display courtesy of the Jack and Lois Edmiston Collection, Lexington, Kentucky.